Why a separate thread? Because it's not just a game, it's a lifestyle. My name is Charlatan and I'm addicted to create.swf. Maybe I should take it easy. EDIT: Courtesy link for the confused. A little something I did ◊. It was also uploaded to pooshlmer. I am not a bunny! I just used create.swf to make a short-cropped yellow-haired kitsune with a bonnet hiding pointy ears. And a mallet. And she's a Meganekko. And so I was reborn... and no-one noticed anything had changed. A fun Easter Egg in create.swf! Take a character, drag them over an instance of the Mysterious Gap (Toys menu) and watch what happens. Awww man, I almost won on my first try! Aww, don't feel bad, Fawriel. Why don't you kick back and take it easy? Is there a trope for having unmatched shoes/boots? Because Ace Of Scarabs has an interesting character design that demonstrates that trope. Fashionable Asymmetry. 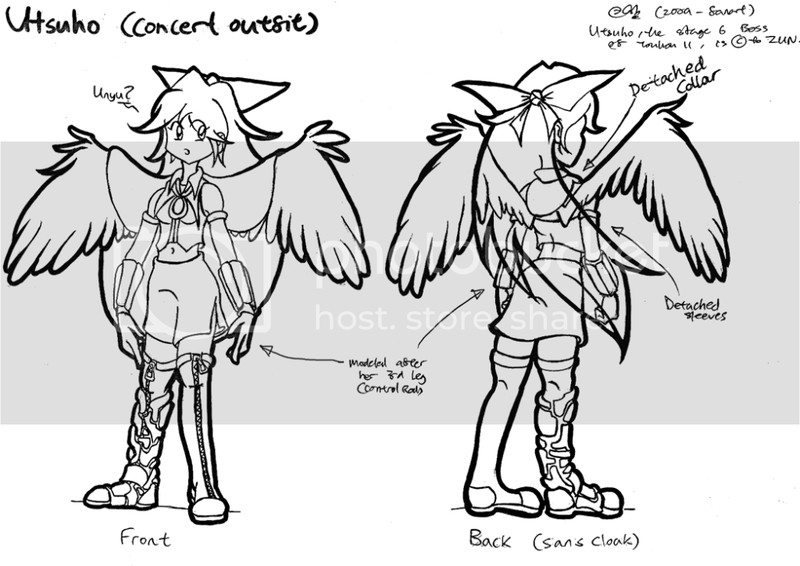 Okuu's right boot is usually covered in concrete which is said to come from Chernobyl, or represents it. Reiuji Utsuho (Okuu) is supposed to have inherited the power of a Yatagarasu, which is a kind of crow god associated with the sun. These are said to have 3 legs. She's also a nuclear reactor, and ZUN decided to make each of these 3 legs symbolize a part of that. Her right foot is encased in concrete and her left foot has particles orbiting that look like a simplified diagram of an atom. The third leg is the control rod on her arm. It's quite a bizarre character design. Way ahead of you, man. Only three of us? Sad. Alright, I'm on board. Here's a youtube clip of Cirno showing off the latest internet meme I've seen. Extremely moe. Happy (9)-day, everyone! Best sheet music ever. There can only be (9)! Explanations are in the Baka trope page. Edit: It should be noted, that I did not discover Flandre's theme with a McRoll: I heard it first in the flandre-hacked-belong-max-level video in Mercy Mode. In the Phantasmagoria of Flower View manual, there was a picture showing the in-game screen, with useful notes like (1)-Player character, (2)-life bar, etc. Cirno (the strongest) was referred to as (9)-Baka. Hence, Cirno was known as (9), circle-nine (Jap: Marukyuu). And that makes 09/09-09 her day. Fun fact: 9:09 AM today, Cirno beat Chuck Norris. It all makes some sort of twisted sense, now. Now that it is 9/9/9, can someone help me? Very well, I suppose that if I must, I shall just have to participate. However, try not to distract me too thoroughly from my ruminations. There are those among us with goals to achieve, and lessons that need to be learned.